El Bodeguita Antonio Romero: merely 75 years old, this place is run by tall dusky Andalucians with abundant dark curls in crisp white shirts. Ahem. Casa Moreno, where you eat at the back of the shop on rickety boards set up on crates of soft drinks. It’s chaotic and friendly. I ate montaditos (tiny bocadillos/sandwiches) with melted Cabrales, Spanish blue cheese. Vineria San Telmo order La Serena (from Extremadura) sheeps cheese which comes with caramelised onions. Enrique Bercerra: Beautiful tiled exterior. Even the olives were great: crunchy, large, green, juicy, lemony. When ordering in Spain, remember that there are several sizes, tapas are smaller than raciones for instance. 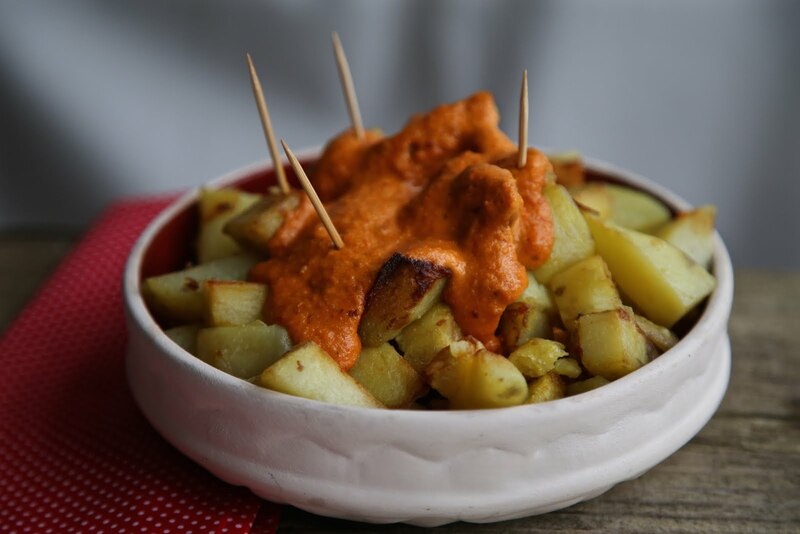 It’s so hard to get a decent version of this dish in tapas restaurants, the potatoes are either dry or stale or burnt, but so very easy to make it at home. Traditionally one makes a spicy tomato sauce to drape on top but here I’ve made a version of romesco sauce and added a little Tabasco. Prepare the potatoes and leave in a colander sprinkled with sea salt for 15 minutes. Grill the red peppers and garlic with their skins on. Place the nora peppers in boiling water in a pyrex jug and leave to soak for ten minutes. Use this opportunity to skin the tomatoes by scoring a cross on top, then leaving them to soak in the same boiling water for a few minutes. Remove the tomatoes and peel back the skin. Dice. Once the pepper skin is blistered and the garlic bulb soft, I remove to cool. Strip off the skins and deseed the peppers. Squeeze the garlic from the bulb. Put the red peppers, the roasted garlic, nora peppers, diced tomatoes, the nuts, the paprika, olive oil and sherry vinegar in a powerful blender or food processor and blitz until it forms a smooth paste. This can also be done in a pestle and mortar if you don’t have any kitchen gadgets. Taste and add salt. Take a large frying pan or a deep fat fryer, heat olive oil (at least 4cms deep) until 185cº and tip the potatoes in so that they cover one layer. If there are more do it in two batches. I don’t usually use olive oil for frying but for this dish I do. It’s worth the extra expense on oil. Fry the potatoes until golden brown, once cooked, lift into a bowl covered with kitchen paper to blot the oil. Then transfer into a bowl and serve with the sauce. I’d drink Spanish red. ‘Crianza’ is part of the Spanish system of labelling wines by age – a ‘Crianza’ wine is under two years old. ‘Reserva’ means it has been aged for 3 years and ‘Gran Reserva’ has been aged for 5 years for reds and 4 years for whites. Seriously, who knew such humble ingredients could be so magic? This was my favourite tapa in Seville, to the point that I ordered it in every bar to compare and contrast. They were all good. I’ve tried to approximate the dish with this recipe. It’s not quite right but it’s pretty damn good. Serve with fried bread and a chilled glass of white wine. Rinse and chop the spinach then, in a medium saucepan on a medium heat, containing 300ml of boiling water with salt and a tablespoon of the olive oil to keep it green. 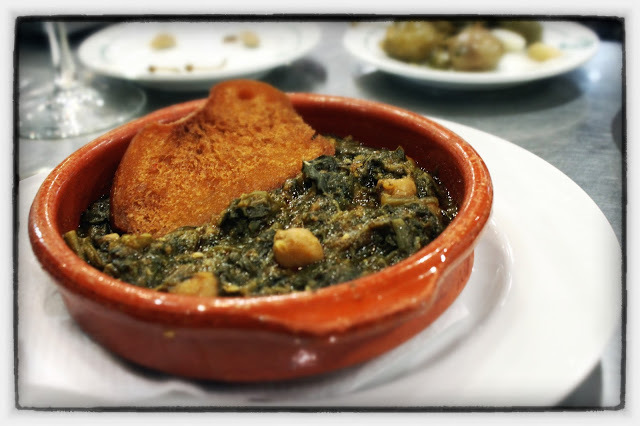 Once the spinach is tender, a minute or two, stir in the garbanzos and turn down to a very low heat. In a small frying pan on a medium heat, add the rest of the olive oil and sautée three whole cloves of garlic. Remove the garlic when browned then add the two slices of bread; fry on both sides until golden and crispy. Remove the fried bread and reserve in a mortar (or food processor) with the whole toasted garlic. Returning to the frying pan, in the same hot oil, add the three cloves of minced garlic and the sweet smoked paprika, stirring them together quickly. Then add the oil, garlic and paprika to the saucepan with the spinach and chickpeas. In a mortar or a food processor, grind/mash the garlic with the toasted bread, cumin, vinegar, and water (until you get a nice thick paste). Add this mixture to the pot, stir well and simmer over medium heat for ten or fifteen minutes to reduce broth. People associate Rioja with red wine, but the whites must be tried. 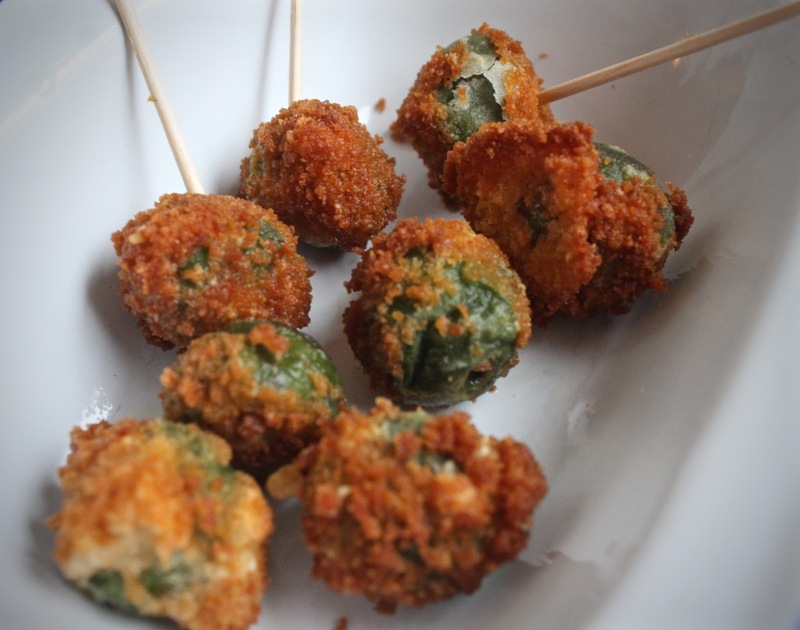 Great even as an aperitif with anchovy or lemon stuffed olives. 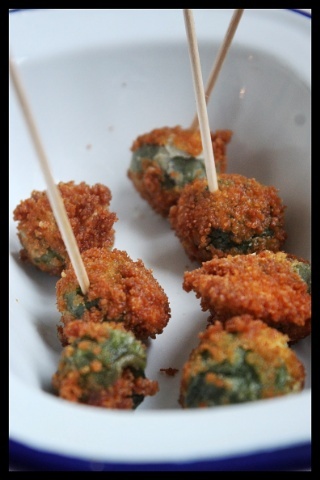 Spectacular and tasty canapé, perfect with cocktails, l’apero or any pre-dinner drinks. 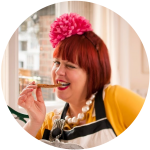 This recipe can easily be expanded depending on the size of your party. 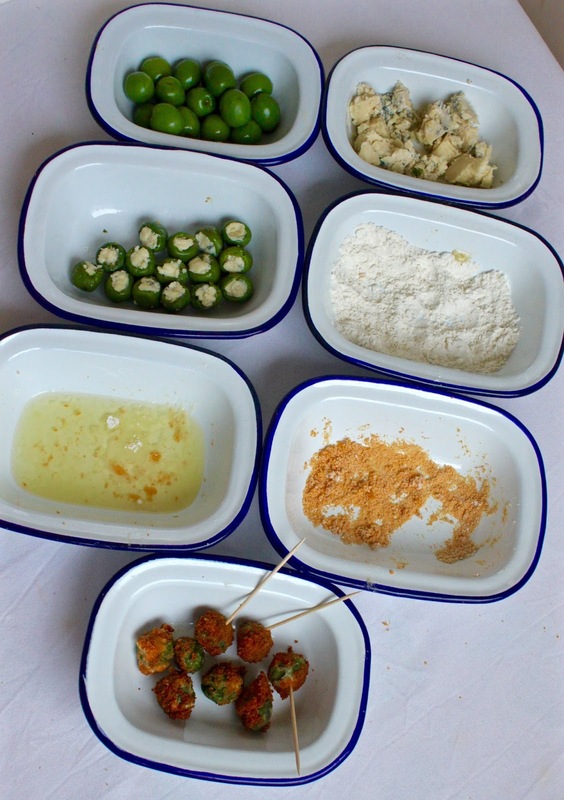 Roll the cheese into small (approx 5g each depending on the size of the olives) pellets that can easily be slotted into the green olives. If the olive opening is small, poke in the cheese with a cocktail stick. Consecutively drip each olive into the flour, the egg whites then the breadcrumbs. In the meantime, if using a deep fat fryer, preheat it to 180Cº or, if shallow frying, pour enough oil into a small saucepan, approximately 6-8 cms deep, to fry the olives. Carefully, using a slotted spoon, place the breadcrumbed olives into the heated oil and fry for 3 minutes or until golden. Serve immediately with cocktail sticks. You don’t want everyone’s paws on the olives – as bad as double dipping. I’m a huge fan of sherry, thinking that sometimes it goes even better with food than wine. While it doesn’t contain ‘umami’ as Heston once claimed, it does bring out the 6th flavour in your food. When Fino is chilled and it’s a hot day, I could swig this throughout a Spanish meal. Perfect with tapas. Fino is a sophisticated taste, which takes a while to get used to if you are more familiar with the sweet thick fig-like sherries such as Pedro Ximenez, San Emilio, Lustau. Refer to the latter as ‘PX’ if you want to sound knowledgeable.